"American Sniper" is on track to make $200 million in its first ten days of nationwide release, a feat matched by only a few R-rated films in Hollywood history. The Oscar-nominated Iraq War movie, starring Bradley Cooper as the legendary sniper Chris Kyle, may go on to beat 2004's "The Passion of the Christ," which currently ranks as the highest-grossing R-rated movie of all time. "Passion" made $370 million in 2004. "The Matrix Reloaded" made $281 million in 2003. "The Hangover" made $277 million in 2009. And "American Sniper" is already well on its way there. The movie came out nationwide on January 16 and instantly topped box office expectations. It's continuing to do so: "American Sniper" earned $18.3 million on Friday and another $28.8 million on Saturday. The movie's distributor, Warner Bros., expects it to to make $17.3 million on Sunday, for a weekend total of $64.4 million -- giving the studio one of the top ten "second weekends" in Hollywood history. For perspective, the country's next biggest movie release this weekend is "The Boy Next Door," starring Jennifer Lopez. It is on track to make $15 million for the whole weekend. As "American Sniper" has made millions, it has generated new conversation -- and controversy -- about the Iraq War and about Kyle, who was said to have 160 "confirmed kills" during the war. On Friday night Bill Maher called Kyle a "psychopath patriot." Others have defended Kyle and praised the movie for starting conversations between veterans and civilians. "At the end of the day, for us as veterans, there's nothing that has more powerfully connected the American people with our stories so far than 'American Sniper,'" Iraq and Afghanistan Veterans of America executive director Paul Rieckhoff told me on CNN's "Reliable Sources" on Sunday. Movies like "American Sniper" make most of their money Fridays through Sundays. In its opening weekend, including the Martin Luther King Day holiday on Monday, "Sniper" made $105 million, setting a new record for a January movie release. "It feels like summer in January," Rentrak senior media analyst Paul Dergarabedian said earlier this week. "This film is swimming in blockbuster waters and generating numbers generally reserved for super-heroes and summer movies," Dergarabedian said. One sign of the strength of "American Sniper" is the relatively small week-to-week drop-off in ticket sales. Movies like "Sniper" regularly see a 50% to 60% decline in week two. But the fall in ticket sales between the first and second weekend is only expected to be about 28%, according to Dan Fellman, the president of Warner Bros. domestic distribution. Translation: "American Sniper" is still generating lots of interest. If Sunday's box office totals come in as projected, the movie's cumulative total will be $200.1 million. In an email on Sunday, Fellman said "only 30 films have reached the $200 million benchmark after 10 days in wide release." The movie was initially released in December to only two theaters in New York, one in Dallas, and one in Los Angeles. The strategy worked, and there was widespread interest in the movie by the time it opened nationwide. It wasn't a coincidence that the Academy Awards nominations were announced a day earlier. Cooper was nominated for best actor, and the movie was nominated for best picture. That gave "Sniper" even more momentum. 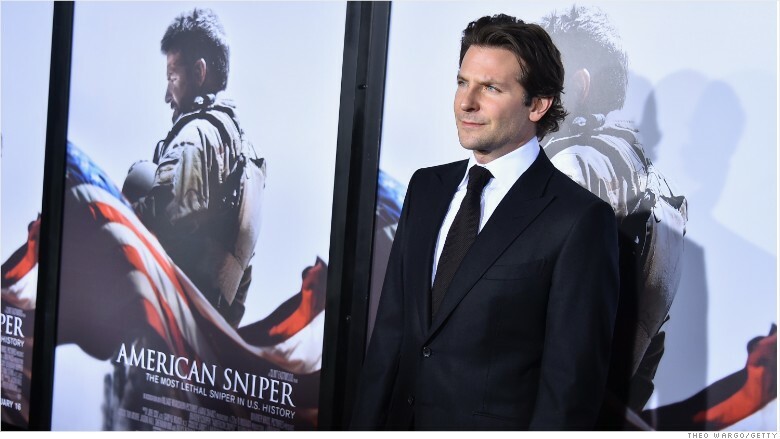 The strong start for "American Sniper" was boosted by the Oscar nomination of star Bradley Cooper. Controversies surrounding the movie have helped to sustain interest, even though some of the stories have been sharply negative. Some people have celebrated the movie for its unflinching portrayal of combat in Iraq, while others have assailed it as war propaganda. The word "MURDER" was scrawled on one movie billboard near Hollywood. Rieckhoff, on Sunday, said "it's kind of become like a Rorschach test for how you view the war." --Molly Shiels and Frank Pallotta contributed reporting. Watch: Will 'Sniper' debate affect veteran's trial?